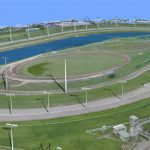 The Gold Coast Turf Club was seeking approval to add additional lighting towers to meet night racing requirements and television standards for illumination. A combination of terrestrial laser scanning and UAV photogrammetry was used to capture the site and its surrounds. From this, a full colour point cloud of the racecourse and surrounding areas was created. The JB modelling team took information from the lighting engineers on the proposed new light towers. Each proposed tower and its light projection was accurately modelled to analyse its illuminance and visual impact on the surrounding areas. This information played a key role in achieving an approval for the client. Learn more about this project by speaking with Wayne Geradts on 07 3319 4933.